JULY 14--Since you usually can't anticipate an arrest for drunk driving, a motorist does not have the luxury of planning a wardrobe for the mug shot session. Floridian Jon Matteson, who last month pleaded no contest to a reckless driving count, knows all about that predicament. 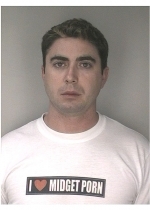 The 28-year-old was wearing a rather distinctive t-shirt when he posed for a Hillsborough County Sheriff's Office mug shot following his December 2004 DUI arrest.